Well this kind of died away didn’t it? Not. Better late than never, right? My hoop journey gets interrupted a lot due to work, but really that’s just an excuse I give myself because I have no confidence whatsoever. Although I did hoop at one of my favorite bars recently and I picked it up like I had never stopped, and that was reassuring. Tomorrow I’m supposed to hoop for a music video. Supposedly there’s other girls and IMO I can already assume they’re much better than me. I’d like to have the mentality that I could learn from them and it would be awesome to hoop with other hooper’s vibes & energy because I haven’t done that in a while, but I have no confidence in how I look while hooping let alone if there’s a camera recording me. I do want to point out where I am in terms of actual hoops though. I started out on a 3/4″ 36″ diameter that actually had some water in it to weight it. I’m now on a 5/8″ 33″ polypro tube hoop that’s much later and beautifully wrapped in gaffer’s tape. I have a new LED that’s 36″ and slowly alternates through different color varieties and is 1/2″ tubing so it’s much lighter and quicker. 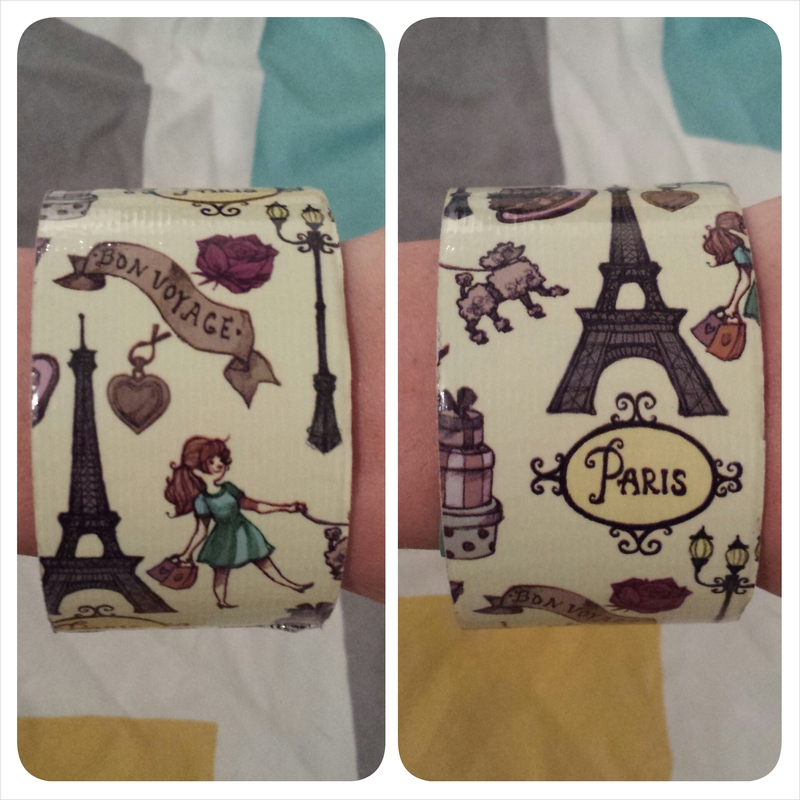 I’m planning on putting gaffer’s tape (which I got for Christmas, thank you Chrissie!) on the inside tonight so that this weekend I can use the hoop I bit more with some gaffer’s tape. My question for any hoopers reading would be do you prefer gaffer’s tape on the inside or wrapped widely around the hoop, or maybe criss crossed around the hoop? Leave me your feedback and let me know what you prefer! Thanks, Happy Hooping, and here’s to a year of more blogging! When I first made hoops at home, I only made a couple just to get started. So I had more than 50 feet of tubing just chilling in my apartment. I slowly started making more, and one day I decided that I wanted to make some mini hoops. I made 2 22″s because my birthday is 2/22 and I thought it was clever. Typically minis are actually smaller than 22″, but I have unusually long arms so my thought was I’d be able to make it work anyway. I could still be right, but they are pretty big for minis and other hoopers (and non-hoopers) are quick to point it out haha. For a while the two hoops just sat by the wall and looked like they were apart of my hoop collection, but I never used them. Soon I started using just one and practicing flow. It actually helped a lot because I could focus more on off body tricks and better yet, practice hooping with my left hand. I’m still incredibly stupid with my left hand, but there will be a day when I’m not and maybe “ambidextrous” will be a part of my vocabulary! Anyway, here is a quick video of me using doubles 🙂 I’ll be working on more and will share some photos in another post! Blais is ‘Blaze’-ing It Up! The hoop Nick got is one I’ve been eyeing for a while, mainly because the name of the hoop is Blaze! I’m currently working on a routine with it so hopefully I’ll have a full video soon! Something I’ve noticed with this hoop is more people want to try it. But this hoop is obviously more pricey than the hoops I’ve been using, which I made out of insulation tubing from a home improvement store. However to more people than I’m happy to admit, hoops are just toys and therefore are not respected. 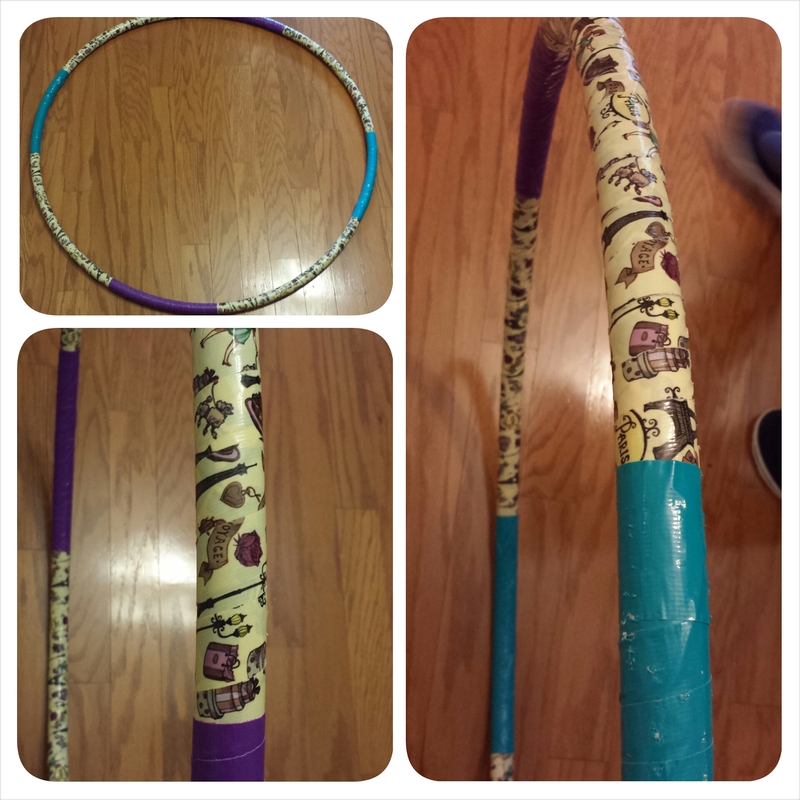 If you’re a hooper and have experienced someone asking to try your hoop, please share your story! like, favorite, comment or follow, I’ll return the favor for sure! When I started hooping, whenever I would be on the phone with family catching up I would tell them about it. My grandma was really excited and one day she talked about how she had seen a woman selling weighted hoops at a Women’s Show she had gone to recently. I told her I’d make her a hoop and finally, today I was able to give it to her! Happy Easter, Grandma! The first time Grandma Blais placed the hoop on the small of her back and tossed it around her waist, it dropped down to the ground in no time. Not accepting defeat that easily, she tried again and this time it lasted a little longer and she had more control. The more she tried, the better she did. Progression for the win! The more tape, the more weight. Common sense should have kicked in but I didn’t realize how much heavier the hoop got after I had taped it. It worked out great for me because I was worried the hoop would be too light for my grandma as a beginner, but the weight of the tape helped. Duct tape, in my opinion, grips better than the electrical tape I’ve been using. But it’s also a bit more painful because it’s not smooth. Maybe that’s my fault for not taping it properly, and that’s most likely the case, but it’s just something I noticed. 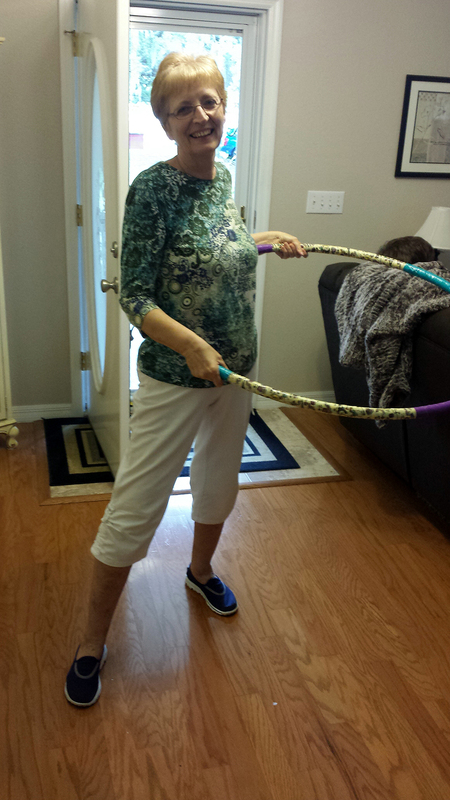 I hope my grandma gets a little happiness from hooping and I help she achieves all that she wants to by starting! 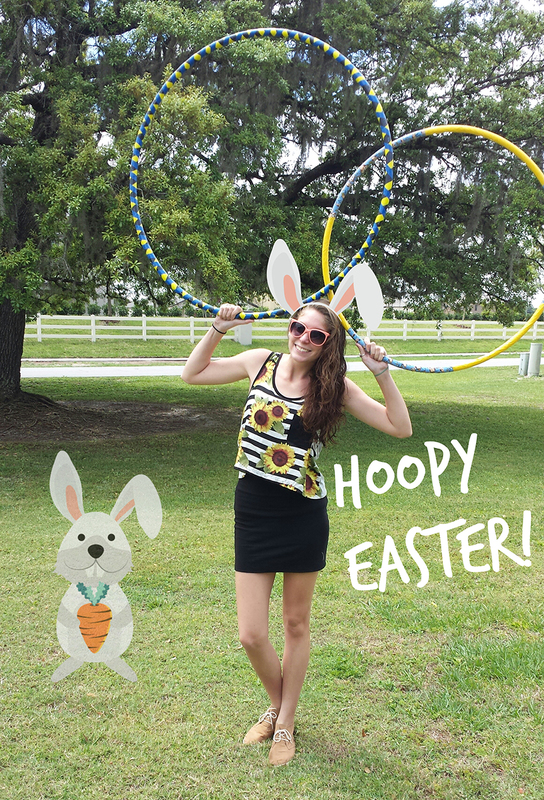 Hooping Can Hurt – But That Doesn’t Stop Me! You show your hoop all the love in the world, by exploring what it can do, connecting with it, and just flowing together. Only to finish a hoop session and discover an assortment of new bruises in places you’ve probably never gotten a bruise before. At first it may seem like a joking matter, but from my whooping month of experience, I can tell you that listening to your body is really important. Believe me, I know the mere thought of taking even just ONE day off from hooping sounds terrible. But if you are really in pain, save yourself from further injuries that may result in even more time off. Or, like Nick had suggested to me, if one part of you is hurting from doing a trick or set of moves, practice something totally different. My hands.The backs of my hands have endured the most amount of trauma, and you can tell which hand I hoop with more based on the fact that the bruise covers half of my hand. There were a few days where I had a bag of frozen peas taped around my hand, and I’d alternate. It’s gotten much better and no more hand bruises, for now! Also, there was a day where I tried hooping around my neck down to my shoulders/chest, and there was a red ring around my neck for a good hour. AND I was getting ready to go to class. So I went to class with this red mark that made me look like I had just been strangled. Fortunately, I was just hooping. One day I was hooping for a couple hours and I can’t remember what trick I was doing but whatever I did caused me to throw my back out. I was stuck in bed for the rest of the day and night. I did some yoga stretches which helped but my back has been getting a work out on it’s own, at first I think my back was mad at me but now I think it’s happy that I’m doing something I love! I’ve heard people say if you’re getting bruises, then your form is wrong or you’re doing something wrong. But I disagree with that to a certain extent because when you first start out in anything physical, you are using parts of your body and putting pressure on skin that your body is not used to. When you start in volleyball, you get bruises on the inside of your arms. When you do a lot of pull ups, you get blisters. When you run track or cross country you get shin splints. But we don’t care. We don’t care because we love the sport, we love the exercise, we love the movement. Hooping is no different. I know that for me the only bad side to getting any kind of injury from hooping is that I have to stop. Finally, I’d like to admit that sometimes I like seeing the bruises. It shows that I’ve been practicing and pushing myself further. I still take care of them and take care of my body as best I can, but it’s kind of cool to see what happens when you hoop too hard! The first time I saw actual ‘hoopers’ was at the Identity Festival in Tampa, Florida a couple years ago. Without going into much detail about the experience of the festival itself (It was life changing, by the way), I was mesmerized by the way girls were not only expressing themselves with a hula hoop and each had their own style, but they were flowing with their hoop. I guess that’s why they call hoopers and poi spinners flow artists. Fast forward to a few months ago when I began to feel this desire to just start hula hooping. I had watched countless YouTube videos, drooled over hoopers at clubs on the weekends, and annoyed my friends and boyfriend when I would say ‘I want to start hooping!’ but never actually started. This hoop in addition to a ½” 32” diameter trick hoop from one of my boyfriend’s friends have allowed me to explore the pros and cons to a bigger, heavier hoop versus a smaller, lighter hoop. I officially started my hoop journey on March 4, 2014 which obviously, is not too long ago. However, I can honestly say that in the short (almost) month of hooping, I feel more confident, happiness, drive, passion, and pure enjoyment in my life. The short answer is: It’s for a class. I didn’t have to actually start one, I just really wanted to. The long answer: I am a Mass Communications major who is very much anticipating graduation in May. One of my last classes in school is an elective I took last minute called Entrepreneurial Blogging. It is taught by one of my favorite teachers and I can only hope that I continue to stay in touch with her once I graduate, although I have a good feeling that I will. The point of the class is to learn the variety of ways people have been or can be successful with blogs. The class is summed up by a blog proposal that we all present to the class. We’ve had numerous guest speakers and a variety of readings to help us learn how to make our proposed blogs successful. When thinking of a blog idea, I really struggled at first. Until I realized that there was something I wanted to start in my personal life and that I could use a blog as a way to track my progression and possibly start a community in the city. Initially when I told a few fellow classmates about my blog, they were like “Really? Hula hooping?”, but as I explained what I wanted to do, a lot of people were really encouraging and supportive. And thus, Blais’nHoops was created!